Bridal couples worldwide are rediscovering platinum as the metal of choice for engagement and wedding rings. The cool, elegant look of platinum for engagement rings and other jewelry is especially popular today and with good reason: it is the strongest, most pure metal. Platinum is 30 times more rare than gold and 60% heavier than gold and will last a lifetime, resisting wearing away and tarnishing. Platinum is currently enjoying a rebirth, yet its beginnings go back to earliest recorded time. As early as the Egyptians, jewelry and objects of art were produced for the Pharaohs using platinum and gold. These items are as stunning today as they were in 720B.C. Strangely enough, after its discovery in Egypt, there is little evidence of platinum being used in Europe or the rest of Africa for many centuries. The metal reappears in South America where it was fashioned into jewelry with amazing technical skill. Then comes the Spanish Conquistadors. Searching for gold, they happened upon this "new" metal. Lacking the technical skills to work the metal effectively, the Spanish government eventually banned its use, impeding platinum's spread throughout Europe until the late eighteenth century. Finally, in the early nineteenth century, jewelers learned to rely on platinum's extraordinary strength for setting precious stones. By 1910 Cartier was already producing superb objects and fine jewelry with this "new" metal. These advances, sadly, were to be slowed by the worldwide Depression of the 1930s and stopped abruptly by World War II. The need for platinum in industrial applications during the war actually led the United States to forbid it use by civilians. 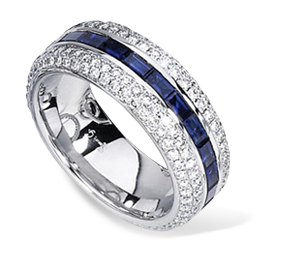 Because of strong consumer preference for platinum's pure white luster, white gold was developed. To	create white gold, yellow gold is alloyed with other metals to achieve a white look. However, platinum is white to begin with and maintains its white luster permanently. Its purity, strength, rarity, durability and naturally rich, white color make it the best choice. The strength of platinum is important for securely holding precious stones. Many of the world's most celebrated jewelry from Carl Faberge' to Louis Cartier and famous diamonds, including the Hope Diamond, are set in platinum. And unlike white gold, which often develops a faint yellowish tinge, platinum's white appearance does not change color with age but rather complements the brilliance and depth of diamonds. Due to its durability, your purchase today will look the same for generations to come, an heirloom to remain in your family forever. 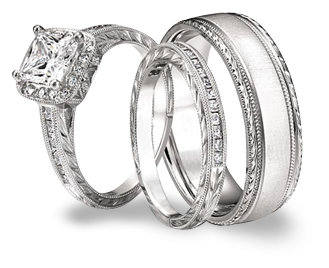 Platinum is the superior option when purchasing an engagement or wedding ring and well suited for the finest of jewelry.